Khan vs Vargas: Should Amir Khan target a fight with Kell Brook or Manny Pacquiao? Amir Khan is in line for a stadium 'super fight' should he beat Samuel Vargas this Saturday night, but would our Panel rather him face Kell Brook or Manny Pacquiao next? Khan will battle Colombia's Vargas in Birmingham, live on Sky Sports, with a showdown against one of his two big rivals a possibility if victorious. 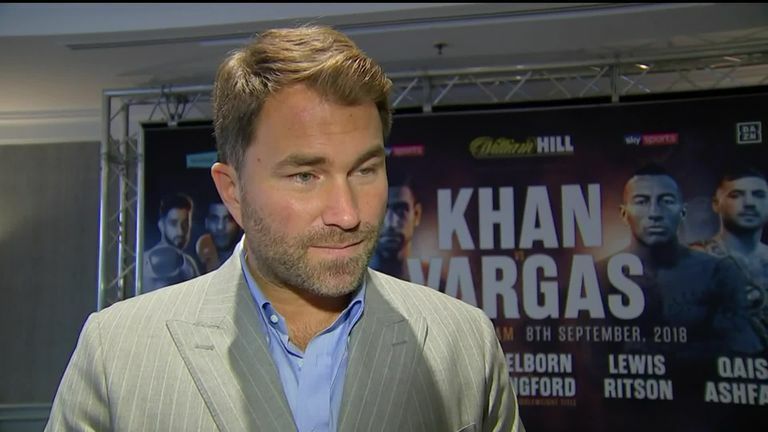 Promoter Eddie Hearn confirmed that a 'super fight' is on the cards for Khan, but would our pundits rather the Bolton star take on Brook or Pacquiao later this year? You've obviously got to pick Brook. It's a big domestic fight and it should've happened a few years ago, but it's still a proper needle fight that everybody wants to see. You've got to pick Brook. It's a proper needle fight that everybody wants to see. Pacquiao is well past his best, so I don't see what Khan gets from that, but Brook gets everyone interested with people debating it and arguing. It might be a bit overdue, but we will all watch it and be on someone's side. We all want to see him fight Brook because it has been mooted for so long now. But I've got to say I wouldn't mind seeing him take on Pacquiao. When their fight was first mentioned, I didn't fancy it because Pacquiao was near the top of his game, but now he's on the slide and also has a world title. We all want to see Khan vs Brook, sooner rather than later. We don't want a Ricky Hatton-Junior Witter scenario. Khan can beat 'Pac Man' and I won't complain about that fight, but in this country we all want to see Khan versus Brook, sooner rather than later. We don't want a Ricky Hatton-Junior Witter scenario. I would like to see the Khan-Brook fight happen, but I personally don't think it will. There's always that one fight that doesn't happen, and I think it's going to be that one. There's always that one fight that doesn't happen, and I think it could be Khan against Brook. Unfortunately, I just can't see it getting made. I hope it does, that would be a great fight for you guys in the UK. Brook is the fight we'd like to see. I think 'Pac Man', even though he had a good win last time out, is pretty much done. The appeal for that fight just isn't what it was. Brook-Khan has the needle, it's a massive domestic fight. Brook has moved up to 154 and looked a million dollars last time out, it's a dangerous fight for Khan if made. The Pacquiao fight does suit Khan better. 'Pacman' still has good speed and power but he looked an old and faded legend back against Jeff Horn. Brook has moved up to 154 and looked a million dollars last time out, it's a dangerous fight for Khan. Brook against Khan is a big domestic bust-up that has come from years ago. It could have happened in recent years, and I would like to see them finally put things to bed in a big fight. The Brook fight has been brewing for a long time now and it'd be sad if we never got to see it. If it doesn't happen soon then it won't happen at all. Khan and Brook are on a level playing field and at similar points in their careers, it's a fight I still want to see. 'Pac Man' has been an unbelievable pound-for-pound champion, but maybe his best days are behind him, that's why that fight doesn't set me alight. Khan and Brook are on a level playing field and at similar points in their careers. Khan against Brook is huge in England, but Khan versus Pacquiao is a big fight all over the world. They're both very interesting fights. I think Khan against Adrien Broner would be a great clash, just because of their personalities and styles. Khan against Brook is huge in England, but Khan versus Pacquiao is a big fight all over the world. Khan-Brook is not going to mean a lot in the United States, because while people are familiar with Amir Khan, they are not as familiar with Brook. They know the name, but don't really have the relationship with him. Khan and Pacquiao in the United States is a huge fight.